Helping Hand Environmental will help support groups, schools and volunteers who are applying for environmental grants with The Greggs Foundation. 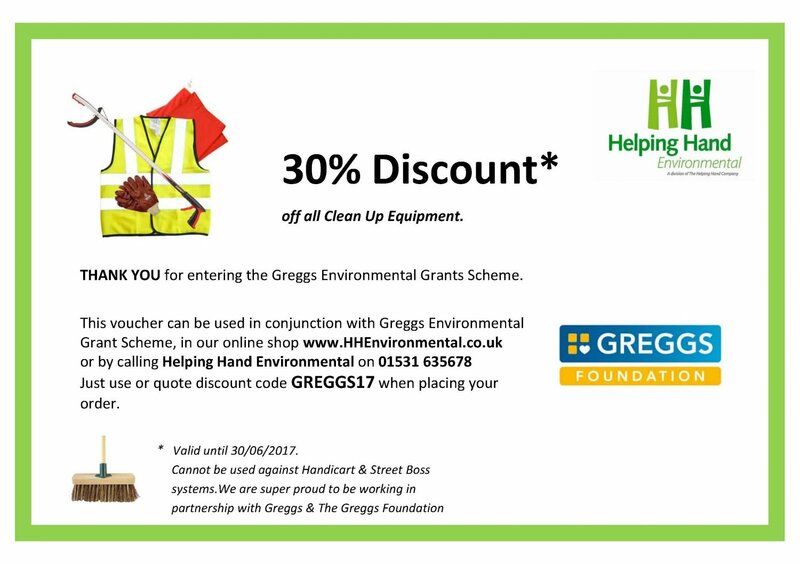 As a working partner to Greggs and environmental partners to Keep Britain Tidy, Keep Scotland Beautiful, Keep Wales Tidy and Surfers Against Sewage with every successful grant application who purchase Helping Hand equipment we will donate back in kind to these charities to help them continue the fantastic work they do! Helping Hand Environmental run special offers throughout the year and ALWAYS have discounted equipment available for volunteer litter pickers, groups, schools and environmental charities with limited budgets (upto 50% off our RRP). We also have stock clearance items and Community litterpickers available to support your grant process for all ages and bespoke/personalised equipment to support your grant application process. What’s more Helping Hand Environmental have a Greggs Foundation dedicated Area Sales Manager Alistair Burnage and Regional Sales Advisor Chrissie Jeffery who will support you with your grant application and equipment quotation – please call them on 01531 635678 or email sales@helpinghand.co.uk for further information. We are super proud to announced our exciting new partnership with Surfers Against Sewage for 2017-2018 by becoming a member of The 250 Club. Helping Hand Environmental is a British manufacturer of litter clearance tools and systems who work with a variety of partners from marine groups, schools, local government to housing associations, contractors, charities, organisations and schools. We supply everything from litter pickers suitable for the daily rigours of litter clearance, litter collection systems, to environmental campaign kits for all ages. Surfers Against Sewage The 250 Club is a business membership scheme of powerful network of leaders, driving forward a movement for change to protect the UK’s unique coastal environment. The 250 Club is a good way of getting small businesses involved in supporting SAS.